The Metro or the Start screen in Windows 8 was only met with warm reviews when it landed on Windows 8, but the utility of the concept can hardly be overlooked. If you like me have found value in the tiled interface, you’ll love this next extension that takes inspiration from the former to fetch all your most frequented pages on the Chrome browser. The extension is called Fast Start Metro Styled Speed Dial and we take it for a spin in today’s review. The New Tab page in Chrome offers you the option of viewing your most commonly frequented sites. But its limited functionality means that you most often end up revisiting frequented sites by typing the address into the top bar, or by clicking on a bookmark. The Fast Start extension for Chrome does a far better job of showing you the most frequented websites when you open a new tab page. 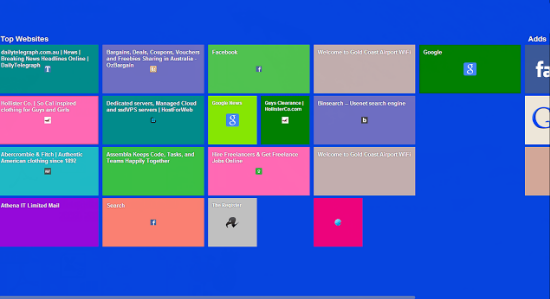 The extension instantly displays the pages you visit most often as colorful tiles in a horizontal scrollable screen. You can tap on the options in the Fast Start Metro Styled Speed Dial bar (at the top of the screen) to quickly view apps or extensions you use, sites you visited recently visited, as well as your bookmarks. The Fast Start extension can also be customized by changing the background theme, changing the tile colors, title and description as well as the tile size and custom background. If you don’t want the tile, you can right-click it to remove it altogether. Fast Start definitely lives up to its name in functionality, however it could do a lot more in terms of appearance and customizability. The tiles are not stylishly designed and the colors are just too colorful. You’ll definitely want to tone them done if you intend to use them for long. Also, the default tiles are not as robust as the Windows Metro tiles and if you were to alter their size, you’ll find yourself adding a new one altogether. There were also glitches with the right-click menu not working in some instances. As far as the Apps page goes, it only displays a list of the Google apps and extensions you use but I was hoping that it would also allow me to disable them, if I wanted to do so. I also hope that grouping together similar tiles will be an option that will become available in the future. For now, Fast Start Metro Styled Speed Dial is a perfectly smart speed dial that lets you access all your most frequented sites in a jiffy. Do give this one a try and tell us what you think.